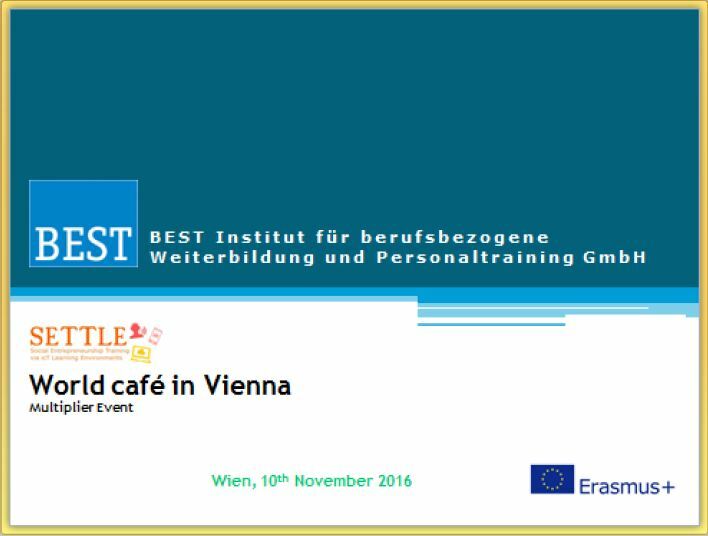 The multiplier event (ME8) in Austria took place on 10th November 2016. We organised the event following suggestions on the World Café methodology from the project application. Some 10 people participated at the event representing other organisations and business areas. The event was organised in one of the BEST premises in Vienna. The main aim was to inform people coming from different expertise areas on the project and its objectives, as well as products. The workshop furthermore was organised to help collate input and feedback from representatives working in social entrepreneurship, training, innovative business, supporting policy matters and initiate a dialogue among participants. The event had its welcoming and introduction session, the World Café for the discussion of the learning pathways and a general discussion with closing round for all participants. The aim was first to present objectives, current activities, members and structure of the project to then get input and feedback on the development. Does this give a good base?, Are the contents fit for purpose?, What is your experience in teaching these topics?, Are there any synergies and collaborations you see? We then organised receiving joint impact on these contents and discussed aspects experts considered as key success factors. Finally, bringing actors in the field of social entrepreneurship and entrepreneurship education together, we also organised social gathering. The event was successful and given feedback was in general positive. Participants were interested in receiving access to the SETTLE platform when ready and learning more about the final products. The discussion on the learning pathways was fruitful; good suggestions were given that shall be taken into consideration for the finalization of the SETTLE products. Finally, the participants appreciated the possibility of sharing knowledge and thoughts and welcomed the development of the SETTLE products. The structure of the event considered presentations and discussions. Participants were informed on the project in general, the partnership, as well as the status of the development progress. For input and feedback collation on developed SETTLE European learning pathways, participant groups were formed and asked to discuss them following the World Café idea. All participants were engaged and motivated during and after the event to contribute, giving feedback, sharing experience and also using in the future SETTLE outcomes where possible. Contents of the pathways presented/ discussed were approved and found useful. 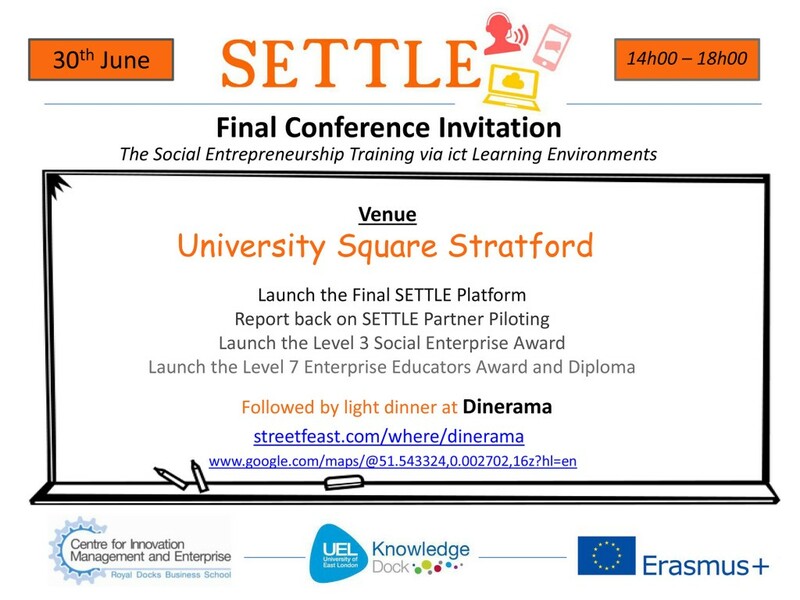 Presentations however were estimated maybe not suitable for all participant groups envisaged by the SETTLE project. They were also interested in learning more on support the platform would later give to learners, social learning included. They highlighted the necessity of simple and easy registration as from experience learners would have access to many contents suitable for learning. They also suggested to include more dynamic learning material then, e.g. giving more practice to theory. Few participants suggested to insert more activities (assignments) in the theory presented in the slides that learners could do on their own with any project they might already be involved in – or should do. Some mentioned the need on considering how the project intended to keep learners motivation at a high level and avoid drop-outs. They were also interested in feedback mechanisms, progress overview and mentioned moodle being in frequent use but not being very appreciated by users in general. When asked in final discussion rounds if they were interested in registering, some would be interesting in using the material for training but were rather skeptical on the format (slides) the material was presented in. They suggested to clearly first address the target audience and then would need material that is adaptable to individual groups. They would register once they could see the real implementation of the learning pathway material. In sum, the event was very fruitful and showed participants were interested in the topic. Particularly learning material on social entrepreneurship was sought after and well appreciated, even if the expectations on SETTLE outcomes might not be met completely at this point.